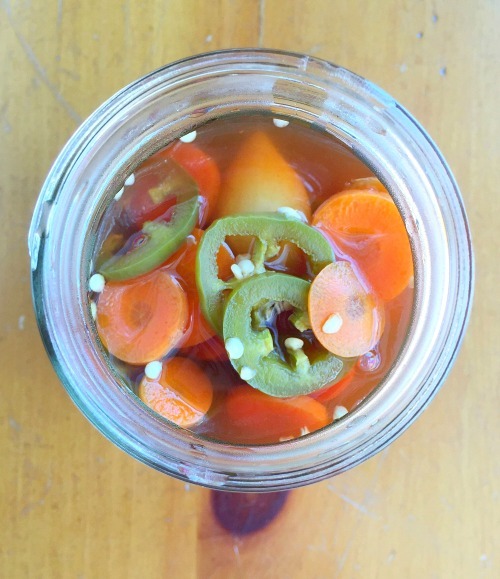 If you like pickled jalapenos, then you are going to love today’s recipe! Pickled jalapenos are one of my favorite condiments. I love them on all kinds of things, including pizza and hamburgers. 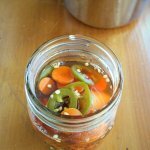 Many of the store-bought ones contain preservatives and artificial color additives, so I was really intrigued when I saw a recipe on Pinterest for easy homemade pickled jalapenos. I have had this recipe pinned for quite some time, but just hadn’t gotten around to trying it. This past weekend, I finally decided that I was going to make a batch. I came up with my own variation that included a sliced carrot. 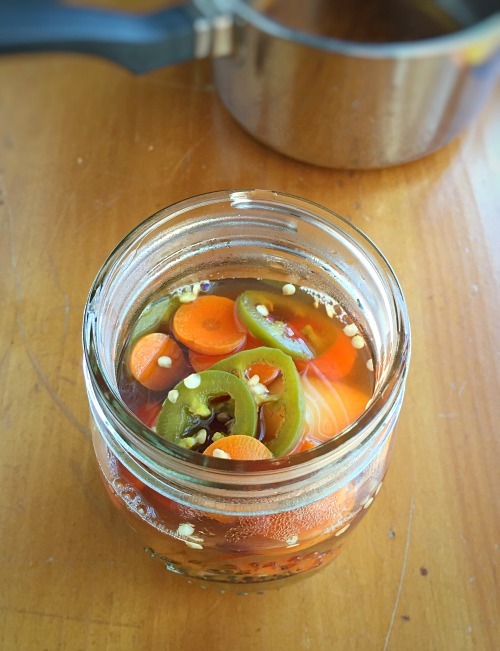 Pickled Jalapenos and Carrots are a common condiment found at taqueria’s and taco trucks. This variation is fairly high on the heat scale, but you could make it milder by carefully removing some of the seeds or all of them. I used apple cider vinegar instead of distilled white vinegar, and coconut palm sugar instead of regular cane sugar for this recipe. You might see it labeled as coconut sugar, depending on the brand. It contains the same amount of carbs and calories as regular cane sugar, but is much lower in fructose. It can be substituted at a 1:1 ratio for cane sugar. I made chicken soft tacos this past weekend, and topped them with these. The tacos were good, but these made them SO much better! They would also be great on a sandwich, hamburger or whatever you like to put pickled jalapenos on. These should keep for up to a month, but our jar isn’t going to last that long. My husband and I absolutely LOVED these, so they are going fast! Cut the stems off the jalapenos and slice them into rounds a little thinner thn 1/4-inch. Peel the carrot and cut into 1/4-inch slices. Lightly smash the garlic clove. In a small sauce pan, add the apple cider vinegar, water, sea salt and coconut sugar. Heat until simmering and the salt and sugar have dissolved. Add the jalapenos, carrot and garlic clove. Let cook in the pan for 1 minute, cover, remove from heat and let stand for 15 minutes. Using tongs, scoop the jalapenos, carrots and garlic into a jar. Pour just enough of the brine to submerge the vegetables. Let cool, place the lid on the jar, then refrigerate. They are ready to be served the next day.